Police are defending a Northland pig hunter who spent two bitterly cold nights lost in the bush with two children. Searchers feared the worst for the trio – George Barbaer, 40, daughter Trinity, 13, and George Junior, 6 – because the Okaihau man was an experienced hunter and knew the terrain well, so something must have happened to stop them leaving the bush as planned on Friday afternoon. Overnight temperatures in Omahuta Forest were close to zero with high winds and heavy rain, and the trio had little food or clothing. The police officer in charge of the search, Senior Sergeant Cliff Metcalfe, was amazed the three were suffering nothing more than mild hypothermia when found about 3pm on Sunday. It was an “excellent result” and a rare happy ending, he said. Mr Metcalfe did not think Mr Barbaer was unwise to head into the bush on Friday morning. It was an ordinary, if breezy, winter’s day; the storm was not forecast to hit until that evening. “I believe they teach them very young up this way and that’s quite normal behaviour for rural kids,” he said. One of the children’s aunts, Maria Speers, said the children were “very hardy”. It is understood the trio snuggled together for warmth at night, building a simple shelter one night and sleeping in the hollow of a tree during the other. A medical check found them cold and hungry but in good health. When the children arrived at the marae, wrapped in borrowed bush jackets, relatives hugged and kissed them repeatedly. A quiet George Junior was carried into the hall by his mother, Raewyn Harris. His first treat was a can of soft drink. His sister, Trinity, was smiling as she made short work of an apple. 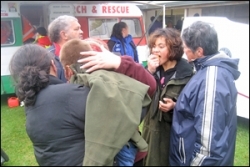 The search and rescue operation was based at Piki Te Aroha marae on the edge of the forest and about 10km northwest of Okaihau. Mr Metcalfe praised the efforts of volunteers who had had little sleep and scoured the bush in atrocious conditions. Just as the trio were found, 20 DoC field staff arrived to help in the search and another 20 volunteers were on their way. The rescue helicopter also arrived, carrying a winch crew and night-vision equipment. Flooding of tracks and streams meant an Army Unimog from Whangarei was needed to get volunteers into the search area. Article care of The Northern Advocate.